Remember my blogpost on Feb 3rd about AIA and how it gave customers a S$50 angpow and then took it back? 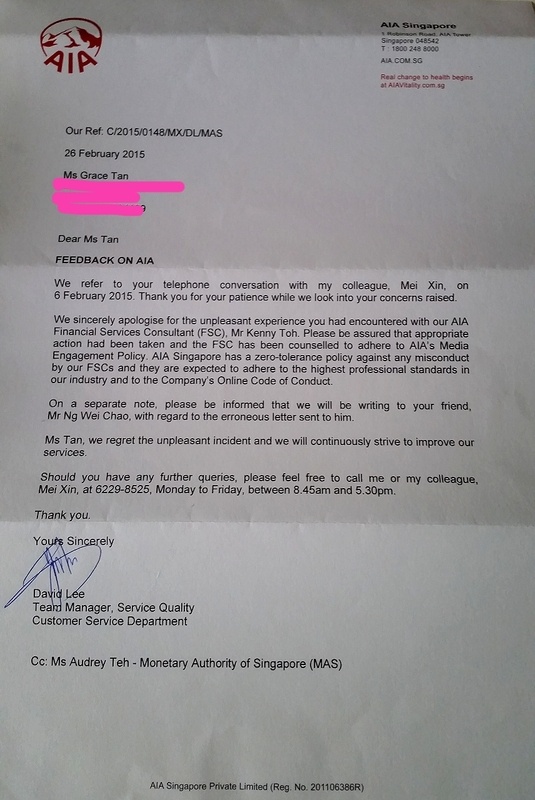 (Read it HERE) And true to my word, I contacted MAS regarding this lapse in service on AIA’s part, and the improper conduct from their agent Kenny Toh. 1) Is AIA allowed to use vouchers to entice customers to sign up for policies, and two, if this is allowed then does AIA not have a duty to follow up on its promises and deliver those same vouchers? 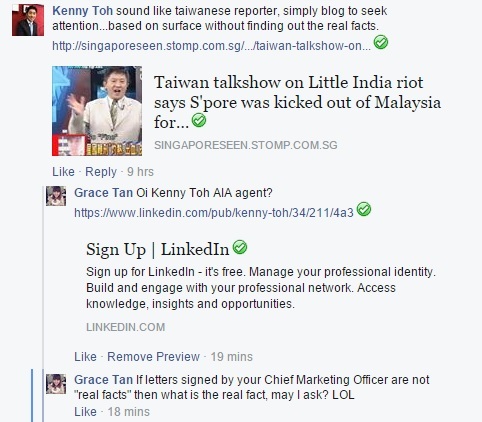 2) AIA agent Kenny Toh has been making some disparaging remarks online. What sort of action is AIA going to take against him? 3) Why in the world is AIA’s Chief Marketing Officer, Ho Lee Yen, keeping silent? Shirk responsibility or hide behind the Customer Service department? Since her signature is on all the letters given to customers, whether it is the original redemption letter or the sorry-there-is-no-redemption letter, shouldn’t she step out and say something? Hello?? MAS and AIA, I am NOT satisfied. Despite what I have heard about the financial planning industry being a heavily-regulated one by MAS, I have seen otherwise. AIA has failed, on so many levels, to convince me that its leaders walk the talk and are accountable for their actions, and their agents (either Kenny Toh or the one serving my friend) have either failed to be responsible online citizens or failed in their duty to alert the customer to any mistake in a timely fashion. You can read our whole conversation over at my previous blogpost, where Kenny proves that he’s not very proficient in English, and yet likes to engage bloggers as a keyboard warrior. AIA, Ho Lee Yen and Kenny Toh, come, I clap for all of you. This entry was posted in Business and tagged aia, aia affluence, aia affluence kenny toh, aia agent kenny toh, aia singapore, ho lee yen, kenny toh, kenny toh aia, MAS by Grace Tan. Bookmark the permalink. I also had the $50 vouchers carrot from my AIA agent. I received it though it came late and after some chasers. You very heng lor. Check out my earlier AIA blogpost. So many customers were disappointed. I think only some agents ‘give in’ and offer vouchers out of their own pocket. Don’t know why this Ho Lee Yen is so irresponsible and unprofessional. Since all the letters have her name and signature on them, she should be responsible. Even if only ONE customer is disappointed, it is already one customer TOO MANY. Surprising this is happening in Singapore. Thanks for bringing out such incidents so that people are made aware of such illegitimate offers. I still remember your post a couple of years ago about ‘creative accounting’ by a former employer of yours and how the MAS helped you to recover what was due to you. Well, it was not the MAS who helped me out back then. It was the CPF Board. Let’s just say that the MAS is a tad less… effective.